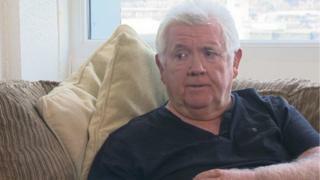 Tom Nolan is 70 and lives on the eighth floor of a tower block in Salford. Canon Hussey Court has similar cladding to that used on Grenfell Tower but there are no definite plans to remove it. It's left Tom and other residents living in a "frightening limbo". "I don't sleep very well anyway but, after the horrific scenes at Grenfell, I just lay in bed thinking about it quite a lot," he said. "Yeah, replacing [the cladding] would be a massive cost. But what comes first, money or lives?" At least 80 people are believed to have died after a huge fire engulfed Grenfell Tower in west London on 14 June. Cladding put on the building in 2015 is suspected to have spread the fire in the 24-storey block in North Kensington, which started in a fridge. Shortly after the blaze, the government ordered tests on cladding on all tower blocks in the UK. Grenfell fire: Who are the victims? London fire: What happened at Grenfell Tower? A number of high-rises, including in Cambridgeshire, London, Newcastle, Sheffield, Sunderland, Manchester and Salford, failed the tests. This included Canon Hussey Court. Mr Nolan remembers seeing the "horrific events" at Grenfell unfolding on television while he was on holiday in Turkey. "Straight away I was thinking of my flat and what the future holds for me when I get back to the UK. "When I got home I phoned up Salix, my home provider, and they tried to reassure me that everything they could do would get done as soon as possible." In the weeks that followed the Grenfell Tower fire, Salix Homes began removing cladding from its high-rise flats, including at Canon Hussey. But the housing association halted the work in July citing "unclear government advice". Three months later, Mr Nolan and his neighbours are still waiting for action to be taken. "I thought they were going to take it all off at that time but it's obvious with the insulation underneath they can't," he said. "Nobody knows if [the cladding] is going to be off in six months or six years, we don't have a clue. "So we're just in limbo and it's a frightening limbo to live in." Another Canon Hussey resident, who does not want to be identified, said she suffers from anxiety attacks and worries that she would not be able to get out in the event of a fire. "My main concern is I would never be found, like them poor people, you know that perished. "We're stuck in this and it's scary, it frightens me. "This cladding really needs to come off. I don't understand why they won't take it off because other organisations are. Why are these not doing it?" Salford City Council is one of those other organisations. As freehold owner of nine blocks in Salford which failed safety tests, it has already started to replace the cladding at a cost of up to £25m. But many private housing associations are yet to make plans to do the same. Salix Homes said it was now getting "some clarity" following government testing on the "safest and most appropriate" types of systems to replace the cladding with. The company said it was taking advice from "technical experts" and would carry out the work "as quickly as possible" but "could not provide clear timescales". Round-the-clock security, additional patrols and new fire alarms had already been introduced and safety was its "utmost priority", it added. A total of 32 tower blocks in Salford have been deemed unsafe after the testing, along with 30 in Manchester, two in Oldham, three in Stockport and six in Trafford. Salford City Mayor and head of the Greater Manchester High Rise Task Force, Paul Dennett criticised the government's response saying it was "kicking things into the long grass" by waiting for the outcome of the Grenfell Public Inquiry. "These residents can't wait for that, they want solutions now, they want solutions yesterday...the government need to be providing some interim solutions for the blocks that have failed up and down the country," he said. A Department for Communities and Local Government (DCLG) spokesperson said public safety was "paramount", which is why it commissioned fire safety tests and published guidance. Secretary of State Sajid Javid told the Commons in June that the government would try and assist local councils and housing associations which could not afford to remove failed cladding from tower blocks. But the DCLG spokesperson said, while local authorities can seek assistance, it is the responsibility of building owners to ensure their properties are safe and it's up to them to fund fire safety measures. Mr Nolan said he would only feel safe when the cladding was replaced. "I love my Salford... I've finally got a home for 15 years that I'm proud of, so I don't want to move, I just want to feel safe." Inside Out North West is on BBC One in the North West at 19:30 BST on Monday 23 October and later on BBC iPlayer for 30 days.